Mustang 3 Inch Race Style Lap Seat Belt Assembly. 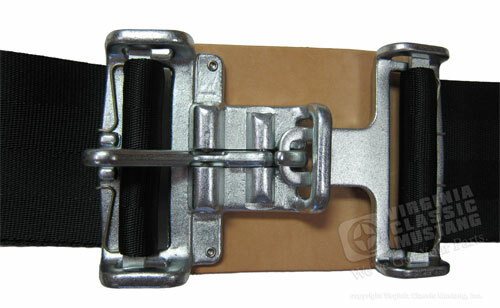 Get that Cool Vintage Race Car / "Period Correct" / '60's look with these super nice seat belts. This style was used in many competition cars during the 1960's including the 1965 and 1966 GT350 Shelby Mustangs. Extra wide 3 inch belt with quick release latch and a genuine Leather Protective Pad adds some extra safety over stock lap belts. Ends have holes just like original seat belts, so mounting is an easy bolt in procedure with absolutely no modifications. Sold as an assembly. This assembly will do one seat/one passenger.